It’s amazing how much can be accomplished in such a short time. Optimize Worldwide is the perfect example of this. The idea for a web design and marketing company that Matt Morgan dreamed up in his bedroom just four years ago has now turned into the largest company of its kind in Redding, CA. As we celebrate this four year anniversary, we are proud to have turned into a talented team of 13 with various web development, SEO, social media and graphic design skills to offer our many clients that span the nation. By hiring employees local to the area, Optimize has been able to keep dollars right here in Redding and help foster its economic growth. We also have the opportunity to participate in many of our great community organizations and events, including Leadership Redding, Soroptimist International, Greater Redding Chamber of Commerce and Rotary, just to name a few. Take a look at Matt’s first Business Spotlight writeup from 2013 with the Record Searchlight to see just how far we’ve come. In the short video below, you can watch a recent interview where he talks about his beginnings in the tech industry, what makes Optimize Worldwide different and more. Though Optimize Worldwide may still be considered a young company, we’re pleased to have already had the chance to achieve so much, making us more excited than ever to see what the future holds. Many thanks to all who have helped us on this incredible journey. I’ve always been an entrepreneur at heart. I started my first company while I was still in high school selling signs, banners, and vinyl decals to local businesses. As I transitioned into the technology field, I continued to run a business selling websites out of my bedroom. Over the years, I worked for a University and a medium sized corporation, however, I always wanted to go back to running my own business, but this time, build a team of experts. I was laid off from a corporation at 11:00am on a Wednesday and had my business license for Optimize Worldwide at 1:00pm that same day. Where did your interest in web design and online marketing come from? When I first ventured into the technology industry, I was trained to build and troubleshoot computers and networks. I quickly found that I was dealing with people’s problems and frustrated clients right out of the gate. Web design and marketing introduced me to more creative and innovative ways of helping clients, and allowed me to partner with business owners who were excited about their next big project. What were your goals starting out, how have they been accomplished and how have they evolved? To be honest, I’ve been winging it since day one. Each year, I set a goal to double our company size and revenue. I have been able to hit the mark every year. My ultimate goal is to support my wife and daughter. Today, my goal is to continue building an amazing team and work myself out of the day to day operations so I can focus more of my time on community projects. 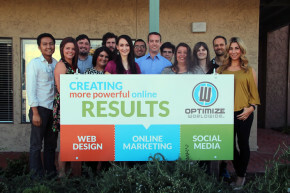 What makes Optimize Worldwide different from others in the same industry? Over 40% of our business comes from outside Shasta County and we only hire local talent. In turn, we bring thousands of dollars back into our local economy. We are also able to pride ourselves on giving several hundred hours back each year to our local community through various volunteer projects. What do you think your biggest accomplishment has been thus far? My biggest accomplishment would have to be our rapid growth, considering, I started Optimize Worldwide out of my bedroom with no money and in less than four years, we are the largest web design and online marketing company in the Redding area. What is the number one piece of advice you give to other business owners regarding their online presence? It all starts with a Google search. Forget about radio, TV and print unless your potential customers can find you at the top of the search engines. Traditional marketing reminds people of the service, yet they won’t remember the name, phone number or website address if they cannot take action at that very moment, leaving them to depend on a Google search later. It’s a shame to watch thousands of advertising dollars be directed at online competitors. What do you hope your business has achieved in another four years? I hope to become one of the larger employers in the Redding area providing tech jobs and mentorship to local startups. I want to be a major contributor to our economic development and continue to incorporate community engagement as a part of our business model. Who would you like to acknowledge for helping you get to your four year anniversary? I cannot thank my wife Holly enough for being patient with me when it comes to my work commitments. There are also several mentors who have coached me along the way, Dennis Black and Paul Barth have been instrumental in my business development. Several resources and service organizations have lent a helping hand as well, the SMART Center, Chamber of Commerce and Rotary to name a few. And finally, I thank my Optimize Worldwide team members for being awesome and taking care of our clients day in and day out.